The question always arises at the first site of anything that looks like mold: Should I use bleach to clean mold? 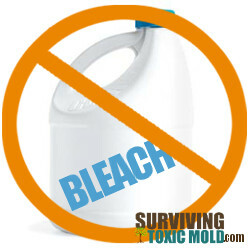 Here are several reasons NOT to use bleach to clean mold!!! When you combine bleach with certain mycotoxins, cleaning agents and VOC’s in the environment, (Volatile Organic Compounds), it will create neurotoxins and cancerous brain tumors. Chlorine bleach (Also known as: Sodium hypochlorite is a chemical compound with the formula NaOCl. It is composed of a sodiumcation (Na + ) and a hypochlorite anion (ClO − ); it may also be viewed as the sodium salt of hypochlorous acid.) When dissolved in water it is commonly known as bleach or liquid bleach. has been classified as a hazardous chemical. It contains 5.25% sodium hypochlorite (NaOCl) and water. It is way too dangerous for common use in homes yet you see all of the "Fluffy" commercials about a certain "brand" of bleach that Moms should wash all their laundry with. This is probably the worst case of dangerous marketing our society as ever seen. OSHA (Occupational Safety and Health Administration) is a federal agency that gives strong warnings against recommending the use of liquid Bleach for mold remediation or even cleaning any kind of mold/mildew. The EPA (Environmental Protection Agency) has since edited their “A brief guide to mold and moisture and your home” so that it now excludes their previously stated use of bleach as a remedy to kill mold. In the EPA's new updated "Mold Course" online they specifically state that "Chlorine Bleach is NOT recommended" https://www.epa.gov/mold/mold-course-chapter-1 If these ruling agencies are making strong statements and retracting from previous advice given that tells us that they have used govt money to fund some pretty extensive laboratory studies. Let these studies be a warning to us all. NOT to use bleach around toxic mold. Bleach is made of 94.75% water. The chlorine stays on the surface and the rest of the 94.75% of the water goes into the porous holes and "waters" the toxic mold. THIS is what "fuels" the mold to return with a rage. The toxic mold will grow at a much faster rate now that you have essentially "watered" it. Remember, toxic molds love moisture. The surface may look very clean because you've "bleached" it (basically changed the color) and not killed the spores. The water then gets into the roots via the porous material and the roots grow deeper, stronger and will return worse than ever before.